Available now, this limited edition screen print by Olly Moss. By Olly Moss , a brilliant and influential designer who's alternative movie posters for films such as Star Wars and the Jungle Book among many others are highly acclaimed and heavily sought-after. 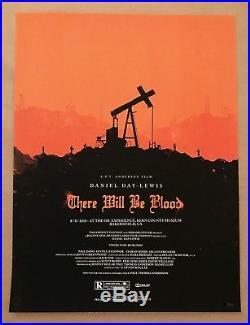 T his listing is for an early and incredibly rare and limited edition screen print, "There Will Be Blood". 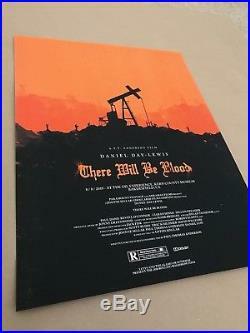 Released by Mondo in August 2010, as part of their "Rolling Roadshow" series, this is an amazing and creative poster for the already-classic film starring Daniel Day Lewis and directed by. 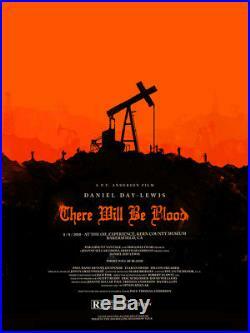 Olly's iconic take on the film's imagery for this poster has been widely acclaimed. 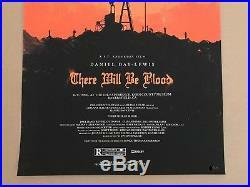 Now almost impossible to find, it is rare for copies of this amazing screen print to surface, don't miss out on your chance to own it. Expertly screen printed by D&L in Seattle, in a tiny edition of only 375 copies ever made. Note: the'wear' on the poster is for artistic effect and is part of the illustration! Sized at 18 x 24. Never framed or displayed, this poster is. And has been stored flat under archival conditions since receipt, no folds or bends or rounded corners. With care by an experienced shipper and collector. If you have ANY questions, do not hesitate to ask! 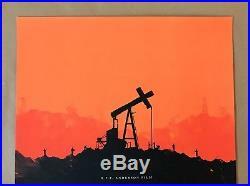 Please check out my other auctions for more great posters. 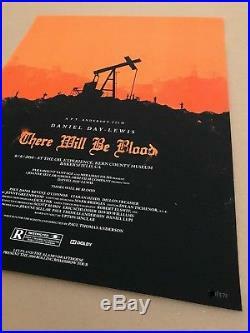 The item "Olly Moss THERE WILL BE BLOOD Poster 2010 Mondo 18x24 Screen Print Star Wars" is in sale since Wednesday, August 15, 2018. This item is in the category "Art\Art Prints". The seller is "noparanoia2" and is located in Beverly Hills, California. This item can be shipped to United States, Canada, United Kingdom, Denmark, Romania, Slovakia, Bulgaria, Czech republic, Finland, Hungary, Latvia, Lithuania, Malta, Estonia, Australia, Greece, Portugal, Cyprus, Slovenia, Japan, Sweden, South Korea, Indonesia, Taiwan, South africa, Thailand, Belgium, France, Hong Kong, Ireland, Netherlands, Poland, Spain, Italy, Germany, Austria, Israel, Mexico, New Zealand, Singapore, Norway, Saudi arabia, Ukraine, United arab emirates, Qatar, Kuwait, Bahrain, Croatia, Malaysia, Chile, Colombia, Costa rica, Panama, Trinidad and tobago, Guatemala, Honduras, Jamaica, Barbados, Bangladesh, Bermuda, Brunei darussalam, Bolivia, Ecuador, Egypt, French guiana, Guernsey, Gibraltar, Guadeloupe, Iceland, Jersey, Jordan, Cambodia, Cayman islands, Liechtenstein, Sri lanka, Luxembourg, Monaco, Macao, Martinique, Maldives, Nicaragua, Oman, Peru, Pakistan, Paraguay, Reunion.